The film tells the story of Samuel, a Holocaust survivor, played by “Barney Miller” star Hal Linden. 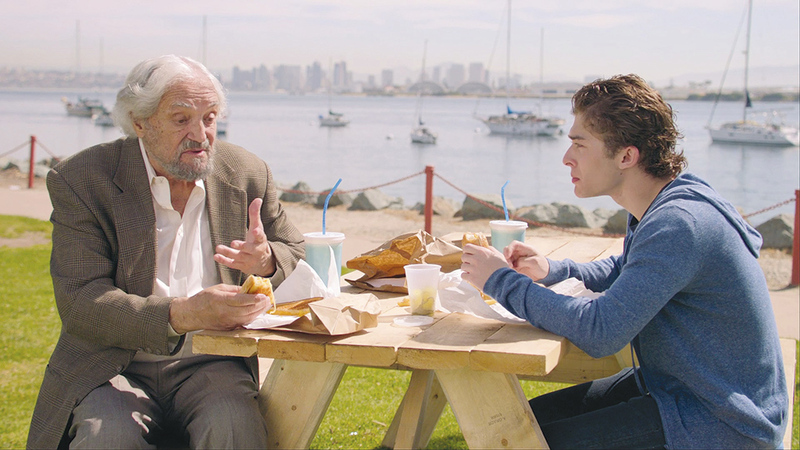 Samuel tells his story to his grandson Eli, played by Disney Channel and Nickoledon star Ryan Ochoa, because Eli needs a subject for a school project. Director Marc Fusco worked as an assistant to Mr. Spielberg for five years back in the 1990s. He picked up credits for “Saving Private Ryan, “Amistad,” and “The Lost World: Jurassic Park.” This also was the height of Mr. Spielberg’s work gathering Holocaust survivor testimonies for his Shoah Foundation, and Mr. Fusco “was fortunate enough to meet a handful of survivors with Steven. Some folks were telling their story for the very first time. Even their spouses hadn’t heard before what happened to them. “It got me thinking about how this dramatic event trickles down in the family a couple generations later, how it affects your kids and grandkids,” he said. Mr. Fusco, the son of an Italian immigrant, grew up Catholic. But as a filmmaker interested in stories, he had a similar encounter with “tight-lipped” ancestors. So how did Hal Linden come to be in the film? It’s a San Diego story. Mr. Linden won a Best Actor Tony for the part of Mayer Rothschild in the musical “The Rothschilds” in 1971. He earned many Emmy and Golden Globe nominations for playing Barney Miller from 1975 to 1982. Mr. Linden, 88, grew up in the Bronx. “I had an interesting relationship with my father,” Mr. Linden said. “My father was an ardent Zionist from the beginning of the century. He was very involved in Zionist support groups. When World War II began, I was an 8-year-old assimilationist. “I was doing fine in America. I had my Irish friends, my Italian friends. Since 1997, Mr. Linden has been the national spokesman for the Jewish National Fund. He has been to Israel many times. He plays a grandfather in the film. In real life, he’s looking forward to becoming a great grandfather in July. Micki Leader, chair emeritus of the Rockland Jewish film festival, said that “the film is perfect for tweens and teens.” The festival scheduled an afternoon showing during Passover for families who are off from school that week. Mr. Fusco said that kids from 12 to 18 “can relate to the grandson character. He’s fighting to do something with his life that he’s going to be happy with. Every teenager in the country can relate to the story, having a dream and fighting for it despite your family not approving and no one really understanding what you’re going through. “Kids may not choose it if it’s a choice between ‘The Avengers’ or ‘The Samuel Project,’ but if you get them there, they end up loving the movie,” he added. Mr. Linden said the message of the move is to “reach out. Communicate. “We start with three members of a family who really don’t talk to one another. Once a month they get together and have bagels. The family is brought together in the end by the boy’s talent for drawing and love of art. If you’re a true Hal Linden fan, you’ll want to see “The Samuel Project” at least once. But you also have a rare chance to see him live on stage only two hours away. Mr. Linden will be performing at the Bucks County Playhouse in Pennsylvania from April 23 to April 27. He will join the national touring company of “In the Mood,” a revue featuring music from 1940s, as a clarinet player. “I’ll play my Benny Goodman medley and do my big band numbers,” Mr. Linden said. Mr. Linden was a professional musician before becoming an actor. “Even in the army I was a bandsman. I was always the boy singer in the band, the one who sang all the pop songs. That way I could smile at the girls,” he said. When he got out of the army, the big band era was ending. “I figured I’d try the stage,” he said. When: Wednesday, April 17, 7:30 p.m., and Wednesday, April 24, 1:30 p.m.
Full schedule and advance ticket sales at jccrockland.org/film-festival.